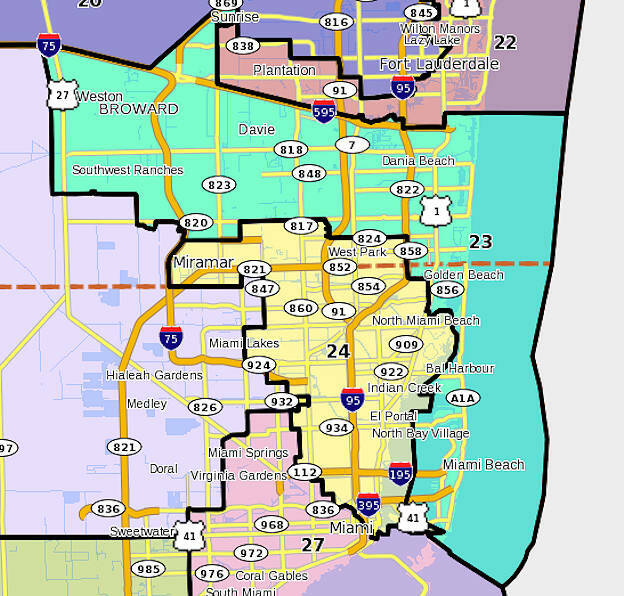 Congressional District 23 gets a lot of attention because it is currently represented by Debbie Wasserman Schultz, who is also the chair of the Democratic National Committee. The Republicans would therefore dearly love to unseat her, but the odds of doing that probably aren’t too good. The L-shaped redrawn district covers most of the inhabited parts of Broward County south of I-595 and then hooks south to include the ocean beach communities all the way to South Beach in Miami-Dade. Unlike other districts that include parts of Miami-Dade, this one has an Anglo white plurality—almost 50 percent. Hispanics are about 37 percent of the voting age population, but only about a fourth of Hispanics in the district are Cuban in origin. Less than one-eighth of residents are black. The official demographic data from the redistricting website doesn’t include this kind of information, but the district obviously includes a substantial Jewish and gay population. Debbie Wasserman Schultz has been in congress since 2005, and before that was a Florida state representative for eight years. She has been a rising star in the party, and was chosen the DNC chair in 2011. If you’re at all familiar with the Democratic Party’s platform, you’ll know where Wasserman Schultz stands on the issues. She has been pro-choice on abortion, pro-gay, and pro-gun control, as well as a staunch supporter of the Affordable Care Act and President Obama in general. Her website is here. She is feisty and outspoken. Soon after she took over the DNC, she got into some controversy over an appearance on Face the Nation in which she said: The Republicans have a plan to end Medicare as we know it. What they would do is they would take the people who are younger than 55 years old today and tell them, ‘You know what? You’re on your own. Go and find private health insurance in the health-care insurance market. We’re going to throw you to the wolves and allow insurance companies to deny you coverage and drop you for pre-existing conditions. We’re going to give you X amount of dollars and you figure it out’. Of course, that has turned out to be a pretty accurate description of the Romney-Ryan position—that is, whenever that position can be pinned down. Both the Sun-Sentinel and the Miami Herald have endorsed Wasserman Schultz for re-election. Harrington says she wants to repeal Roe v Wade, believes life begins at conception, and would cut off funding for Planned Parenthood. She fully supports Paul Ryan’s budget plan, and says she would have voted “no” on the last vote to raise the debt limit—apparently not caring that that would have forced a financial crisis of immense proportions. She seems to be trying to be more Jewish than Wasserman Schultz, calling Obama “no friend to Israel”—the phrase that keeps popping up on those ads by the Jewish Republican Coalition PAC bankrolled by Newt Gingrich’s BFF and benefactor Sheldon Adelson. 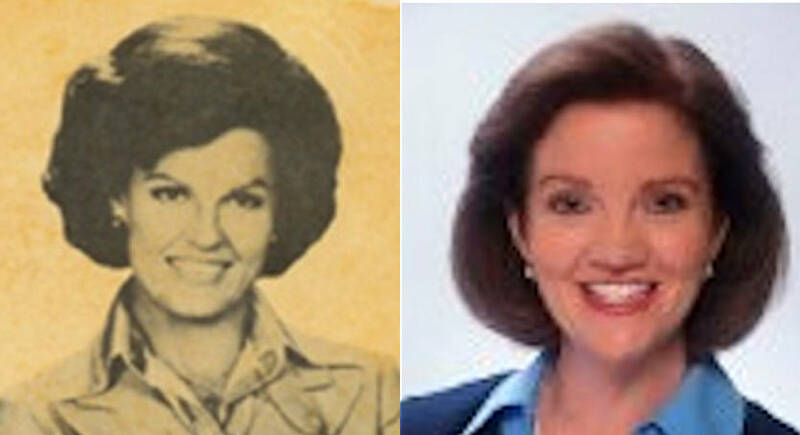 Harrington’s experience has mainly been that of the owner of Rickey’s Restaurant and Lounge in Pembroke Pines (and now two other locations), which would make her one of the “job creators”. I’ve never been there, but it’s apparently a beer-and-chicken-wings kind of place. On-line comments by patrons give it lukewarm to negative reviews. One patron (who “liked it”), said: “It’s not the kind of place you find sleaze [sic] drunks passed out and sloppy, but it kind of looks like that. It’s the kind of place you recognize from those 1970’s Clint Eastwood country movies sans bikers. The food is greasy and about what you’d expect…” I’m no restaurant snob, but it doesn’t exactly make you want to eat there, so would you really want to send the owner to Congress? Really? Bottom line: Vote for Debbie Wasserman Schultz!